It’s hard to believe that my young brother just turned 25 years old! Time flies, people grow up, mature, and become adults that you are proud to call your friend. 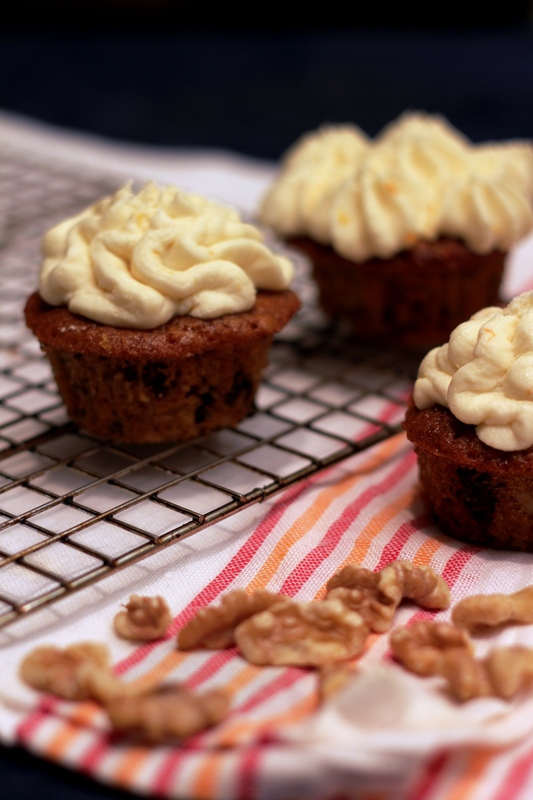 For his birthday, my brother requested Carrot Cake Cupcakes with raisins and walnuts. I took this opportunity to use my wonderful orange KitchenAid and bake something delicious for the whole family to enjoy. 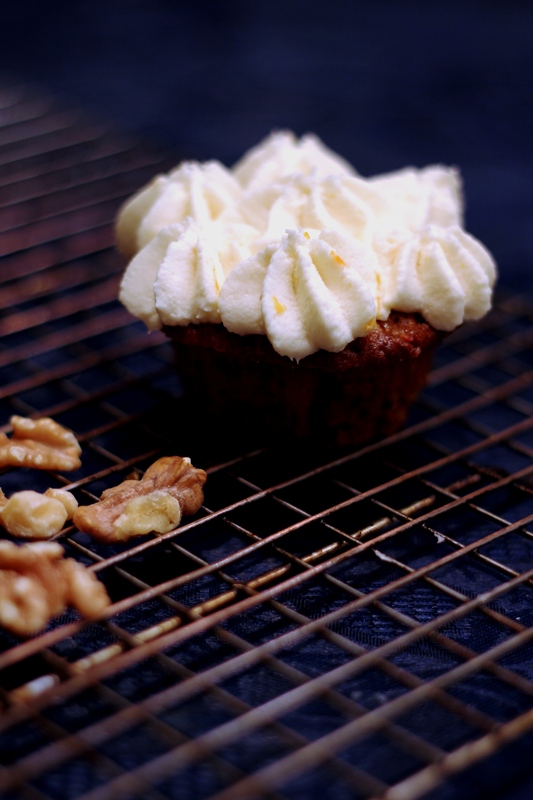 For the recipe, I adapted Ina Garten’s carrot cake cupcakes. 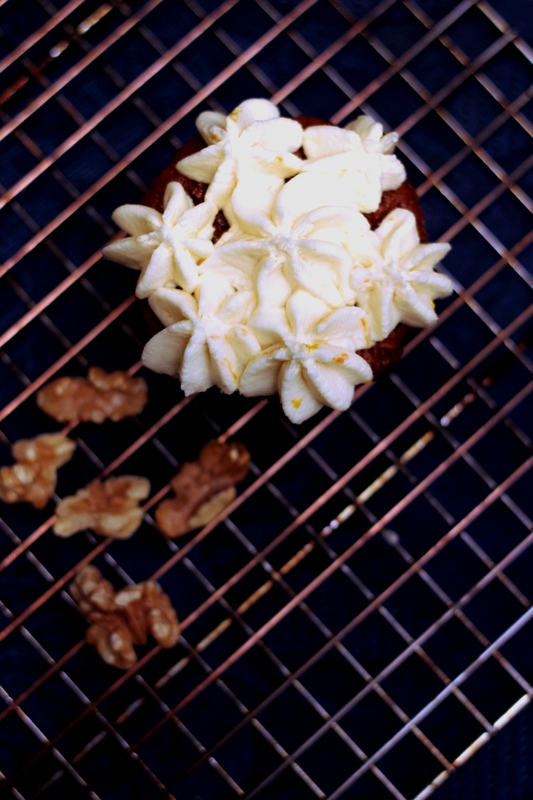 Modifications: 12 cupcake yield, reduction of sugar and oil, addition of baking powder, change in baking directions, toasted walnuts. The frosting was cut in half and dressed with clementine zest. I must admit, I was rather nervous waiting for the cupcakes to finish baking and once I removed them from the oven, my fears did not diminish. But! These were truly fantastic – moist, just sweet enough, with a wonderful texture variance of raisins and crunchy nuts. The frosting with the addition of clementine zest played nicely along, lending just enough sweetness and decadence. 1. Preheat the oven to 350 degrees F. Line 12-cup cupcake pan with liners and lightly grease with cooking spray. 2. Beat together sugar, oil and vanilla until evenly incorporated. Beat in one egg at a time. 3. 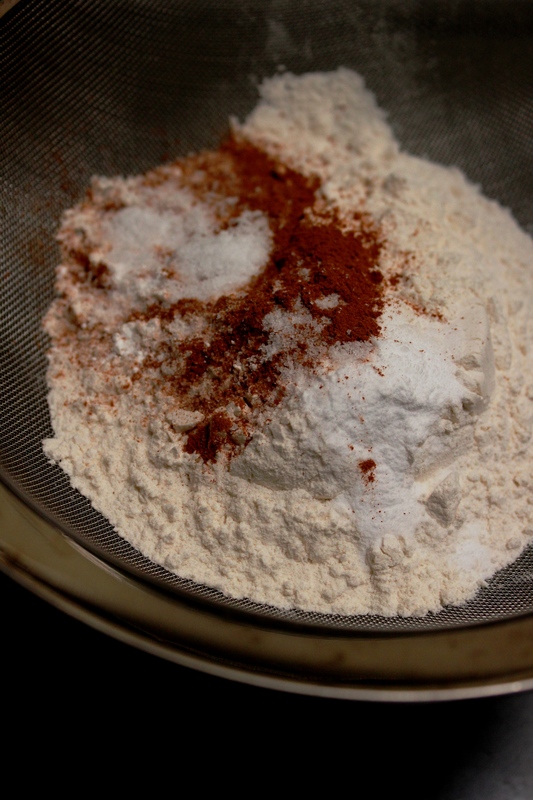 Sift together flour, cinnamon, baking soda, baking powder and salt. 4. 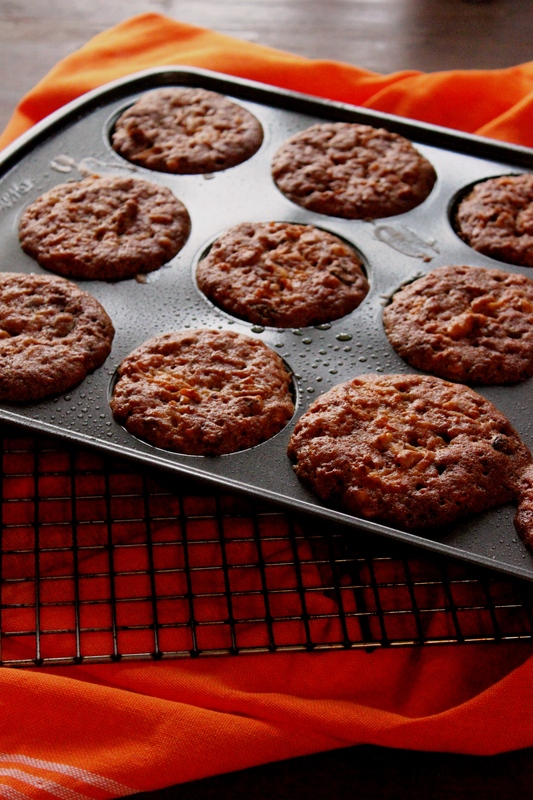 Mix carrots, raisins and walnuts with 1 tablespoon of flour. This will keep the mix-ins evenly incorporated with the cupcake batter. 5. Add half of the dry ingredients to the sugar-oil-egg mixture and mix just until blended. 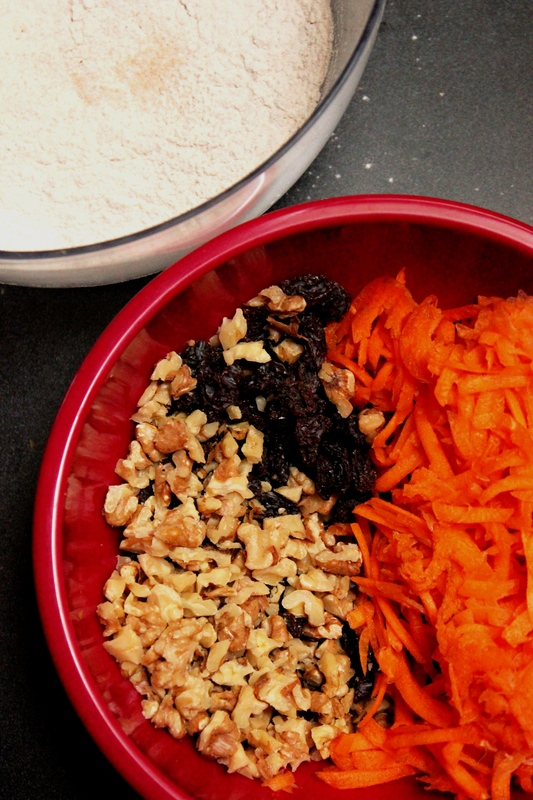 Blend in carrots, raisins and walnuts and then add the rest of the dry ingredients. 6. Divide the batter evenly among the prepared cups. 7. Bake in the preheated oven for 30-40 minutes until the tops of the cupcakes are medium-brown and the toothpick inserted in the center comes out clean. Cool completely on the wire rack. I removed the paper from cupcakes right before frosting. 8, For the frosting, beat together cream cheese, butter and vanilla. Gradually beat in confectioners’ sugar (you might want to sift if first so it incorporates easier). Once the frosting is of your desired consistency and sweetness (you can add more sugar), fold in clementine zest. Frost cupcakes as desired. I fit a piping bag with a star tip and filled it with frosting, trying a few different designs when it came to decorating. If the frosting gets too soft, you can refrigerate it briefly. I chilled the cupcakes for an hour before serving to allow the frosting to set up slightly. These would be beautiful garnished with candied carrots or toasted walnuts. Mine came garnished with candles and a “happy birthday!” song. By the time the cupcakes were baked, cooled and frosted, it was too dark to take any decent photos. Sadly, I took a few with my phone on the bathroom floor. The good news, there are a few cupcakes safely tucked in inside the refrigerator – I will attempt to take photos tomorrow! Sweet wishes. I want the cupcake in second to the last photo! Nice piping skills!